Over the past several days, several individuals (presumably men) have made multiple attempts to edit the Wikipedia entry for #YesAllWomen in order to make it less "misandrist." A tipster pointed Jezebel in the direction of the article's history, which is essentially a muted version of the battle that's been happening on the internet at large since the hashtag was started after the Isla Vista shooting. 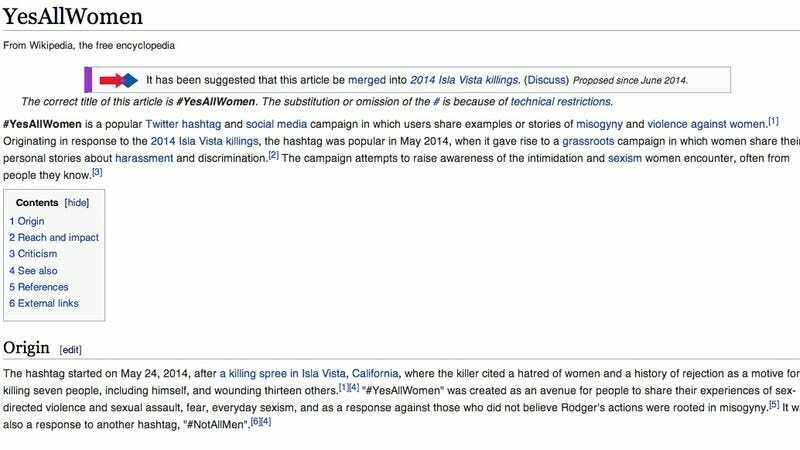 In some instances, Wiki contributors have made edits to the page to give it a more "neutral point of view," noting that despite edits, "It's still kind of a giant pile of feminist propaganda." Others have made changes because they allege that the page contains/ed lots of "misandry." A few users have made edits to the article to debate the facts of the Isla Vista shooting. For instance, take these changes that call into question the motivation behind Elliot Rodger's shooting and allege that the #YesAllWomen hashtag "ended up being used for misandry." I do not feel this article is notable and was surprised to see it even existed. I haven't heard it discussed anywhere in media - at all (but personally obv.). I would support this article being merged into or redirecting to the 2014 Isla Vista killings#Debate about misogyny page. I do not agree that a stand alone article on a twitter hashtag should exist. I created this, so I should chime in about why I thought it was notable. I agree with Odie that while the movement may have started because of one violent act, it quickly transformed into much more than that. That's why I feel it deserves a page where it's separate from the article about the killings. As a side note (and a response to the social media comment), I think we should consider that social media is a space where a lot of women speak out, unlike on the rest of the internet. Perhaps we should consider some leniency with our idea of notability when we want more representation of women (content-wise and editor-wise) on Wikipedia. Also, though you may consider the references op-eds, they're in legitimate sources that typically meet notability requirements. The #YesAllWomen page itself has been labeled "within the scope of WikiProject Feminism, a collaborative effort to improve the coverage of Feminism on Wikipedia." And as Deanna Zandt, co-founder of the Tumblr "When Women Refuse" explained on WNYC's On the Media last week, the hashtag #YesAllWomen has definitely expanded outside of the event that originated it. "There's a lot of discussion right now around the lifespan and the lifecycle of a hashtag," Zandt told host Brooke Gladstone. "I find them very useful as in-the-moment tools. Those tweets will live on until someone deletes them. They will become an archive and a reference point, a point for journalists to dig into stories as other related stories come up." And that's Wikipedia's role: to be an archive and a reference point. That being said, it's still "The Free Encyclopedia That Anyone Can Edit." As long as it stays that way, it's not ever going to be wholly detached from the wars it finds itself documenting.